Constance Anne Parker (1921-2016). Constance-Anne Parker’s life has always revolved round the arts. 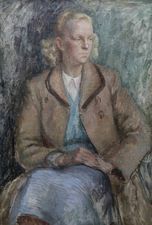 While still a girl she won bronze, silver and gold medals regularly each year at the Royal Drawing Society’s exhibition – then known as the Children’s Royal Academy. 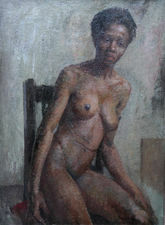 Later she spent two years at the Polytechnic School of Art taking the Ministry of Education’s Drawing and Painting exams. There followed one year at London University’s Institute of Education studying Pedagogy to complete the Art Teachers Degree (ATD). 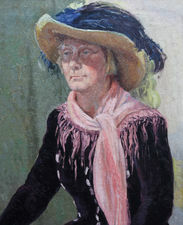 Constance-Anne later gained a studentship to the Royal Academy Schools and while studying there won four silver and two bronze medals for landscape, portraits and life paintings and drawings. She also won the Landseer, David Murray and Leverhulme Scholarships. During this period she also attended the Polytechnic School for evening classes in Modelling and Carving and won its sculpture medal and scholarship. 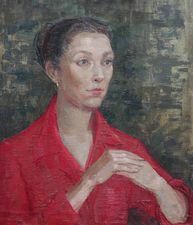 After leaving the Royal Academy Schools she taught for some years and then in 1958 returned to the Royal Academy as Assistant Librarian; a part-time job giving her more time for her own work. From 1952 to 1976 she was the Hon. Treasurer of the Reynolds Club (the R.A. Schools Old Students Society) and was elected Chairman. She lectured widely on the “History and Work of the Royal Academy” and on George Stubbs. Her book “Mr. Stubbs the Horse Painter” was published in 1971. In 1974 she was appointed Librarian of the Royal Academy, the first woman to become an Officer of that institution. 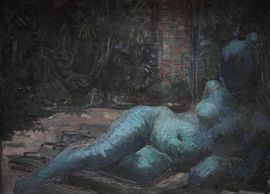 She exhibited widely in both London and the provinces, especially at the Royal Academy (R.A.), The Royal Society of British Artists (R.B.A. 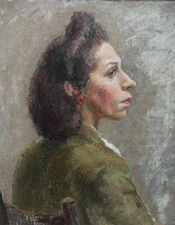 ), Royal Society of Portrait Painters (R.P. ), and The New English Art Club (N.E.A.C. ), and had her first one-man exhibition of her Sculpture at the Belgrave Gallery in London in 1977.